Hello and Welcome to.Quaint town by the Guadiana river,which separates the Algarve,from Spain. Please Click Here.If you wish to return to the main Algarve Information page and Menu. Please Click Here.If you wish to return to the Homepage and main Menu. This is quite a busy little town that caters well for the tourist and Algarve-holidays.With its hotels, holiday villas & apartments, golf courses,entertaining localevents, restaurants and many places of historical interest.
. The first settlements in this area,are believed to date back to 5000 BC, possibly then situated on the hill it would have been a fortress and likely would have stood where the castle now stands.It is thought by some historians and geologists that where the town now stands was closer to the sea and might have even been an island. 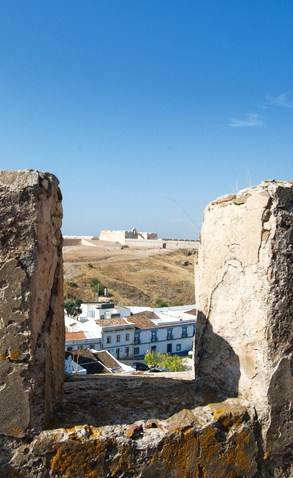 For most of its history it was a port serving ships plying their trade up and down Guadiana river,carying cargo from the metal mines to the north. Both the Romans and the Phoenician's with their many ships plied there goods through here.There was and in places still is a Roman road connecting this area with the Portuguese capital city Lisbon. 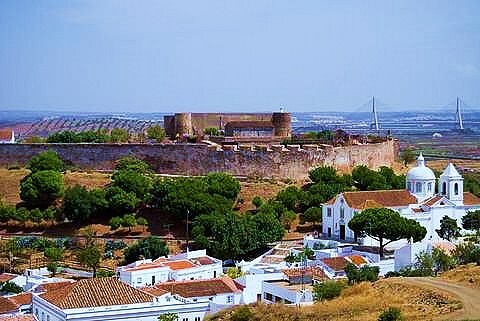 During well documented Moorish occupation of the Algarve and the rest of Portugal;they created extensive fortifications that now lie in the centre of todays castle.The towns strategic position caused the area to become the headquarters of the Order of Christ when the Christians defeated the Moors and Christianity was restored to the whole region.This it is thought was when the town was at its most important with a larger population than even today. As the sea retreated so did the towns economy. Fishing, salt production and boat building then became its major trades untill quite recent times.Tourism is todays major industry and Castro-Marim has much to offer thanks to the rich heritage which pervaded for so long. The town has only 3000 permanent residents in these times,growing considerably in the summer months.For those wishing to travel there it is 52 kilometers from Faro airport,which only takes around an hour thanks to the new N125 which runs through most of the Algarve. On the second saturday of every month the gypsy market comes to the town.It is well worth going to,for passing a few hours.The church Nossa Sra. de Martires is famous and stunning and should be visited with your camera for pictures inside and out.It is situated on a lovely bright clean square called Praca 1° Maio with loads of trees and shrubs. A scene of Castro-Marim showing the lovely church..
For the sports enthusiasts there is a superb golf course. It has spectacular views over the surrounding mountains plus scenes of The Guidiana river and distant glimpses of the sea.It is very unusual being designed as three nine hole courses named "Grouse","Atlantic" and guess what? "Guiidiana".You are able to use these as nines or two great 18 hole courses.Of course with all the natural beauty and spectacular scenery one can take many fabulous walks. 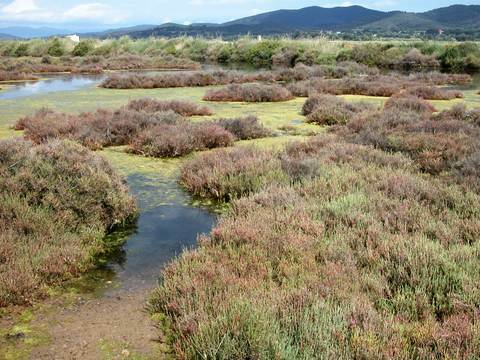 There are 2000 hectares of nature reserve around Castro-Marim.Stretching out to Monte Gordo and Vila Real de Santo António. This protected area is known as the Reserva Natural do Sapal.It is sometimes referred to as The Salt Marsh Nature Reserve and much farming of salt takes place here.This important reserve land is home to may be 153 species of birds.Bird watchers will be able to study Storks,Sandpipers, Avocets and often large flocks of flamingos. This nature reserve is said to be home to more than 400 flora and fauna species and the marshes are home to numerous reptiles and mammals. There is a visitors centre at Cerro da Rocha which can supply much information for the Nature Tourist and dedicated Walkers. For those who love traditional crafts such as lace making and basket weaving.The town of Castro-Marim still has local craftswomen involved in the art of fine lace making.Close by towns Altura and Furnazinhas, craft workers can be found making brightly coloured mats created from esparto and palm. The men folk of Odeleite are to be seen making baskets from local reeds which grow on the river banks in some abundance. What makes Castro-Marim a special place to base an Algarve holiday is its proximity to the Spanish border.In fact you can be over the border in Ayemonte or Huelva in 10-15 minutes having lunch if you wish.Plus a place everybody should go before they die is the Spanish city jewel,Seville.Regular coach trips go there and are easy to book.Or you could drive there in under two hours.Another benefit is the ferry at Vila Real on the border of Algarve and Spain.The ferry crosses the Guidiana river in about ten minutes and deposits you in Ayemonte.A short walk takes you into a typical Spanish Square which on your first entry on a sunny day can take your breath away.Off the square is a myriad of little streets containing small shops of every type,with retaurants and bars etc.It is a great day out. As in the nearby Ria formosa the nature reserve between this quaint town and Vila Real st Antonio has relied heavily on the production of salt and the use of salt pans which trap the saltwater and the evaporation process leaves behind the precious salt.The use of these pans over hundreds of years has led to the forming of myriad trails for you to follow and observe the abundant wildlife on the Atlantic coastline,including 100+ species of birds.The East Algarve is a wondrous place for nature lovers and hikers alike. The dams by the villages of Odeleite and Beliche are more than worth a visit if you like fantastic scenery and what true tourist does not! For local crafts local ladies can still be scene practicing the fascinating pastime of lace-making.This quaint cottage industry will probably never die out in the Algarve.Hand made lace will always have a market amongst the ladies. 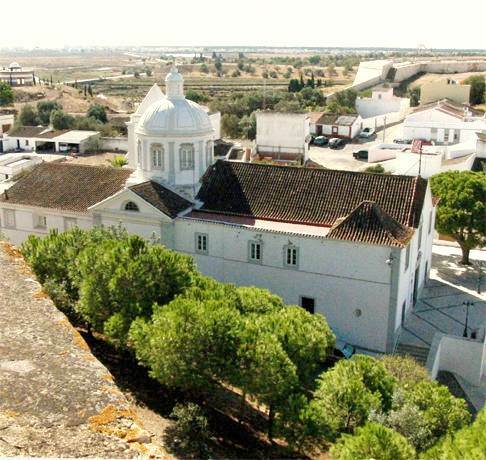 For history and museum lovers,if you make your way to the castle.Inside you will find the Núcleo Museológico do Castelo de Castro Marim. This fascinating little museum displays exhibits from archeological excavations that have shown human occupation in Castro Marim dates back through the Bronze age, Iron age and Roman times. Those Romans really loved the sunny "Old Algarve".They were "All over-it".Cannot say I blame them though!